Which bar of handmade soap should I buy? All you need to make soap is lye and an oil. However, if you make soap with only one oil, you won’t necessarily get what you’re looking for in a bar of soap. Each oil brings different things to the party. 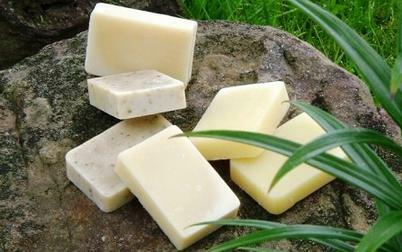 For example, classic castile soap is made using only olive oil. This makes an extremely gentle soap, which is often recommended for children and those with sensitive skin. Sounds lovely, what’s the catch? Soap made with just olive oil is extremely soft, so it must cure for a minimum of 6 months to ensure that enough water evaporates from the bar to make it hard enough to last in the shower and not melt away into a puddle in your soap dish. Secondly, because olive oil is a very heavy oil, the lather may have a somewhat oily feel to it, which some people dislike, and there will not be a lot of lather. A 100% coconut oil soap will be very cleansing, but using coconut oil as more than 30% of your total recipe will give you too much cleansing power, and your skin may be left feeling tight and dry. An all palm oil soap will be a very hard bar, but low on cleansing power and bubbles. Handmade soap recipes are carefully formulated to achieve the perfect balance of cleansing, lather, and hardness. So how does the choice of ingredients affect the price of a bar of handmade soap? If you do a quick Google search for handmade soap, you will find literally thousands of soap makers from all around the world, with very little to distinguish between one and the other. The question I get asked most often is, “Why are some bars so cheap and some so expensive?”. There are a few things which contribute to the cost of a bar of handmade soap. While doing your Google search, you will come across bars as small as 3 oz to some as big as 7 0z. The first thing you should do is divide the price of the soap by the number of ounces in the bar to get the cost per ounce for the soap. This ensures that you are comparing apples to apples. The second thing to consider is ingredients. The list of possible oils to use in soap range from those at the lower end of the scale, such as corn oil, soy oil, canola oil and cottonseed oil, high end oils such as coconut oil, palm oil, and olive oil, and luxury ingredients such as cocoa butter, shea butter, babassu oil etc. The cost of a bar of soap is directly affected by the cost of the ingredients. Next, take a look at fragrance. Are the bars scented with pure essential oils, or more inexpensive synthetic fragrance oils? If the soap maker has used essential oils, there can still be variations in the cost. For instance, the more expensive essential oils, such as patchouli and ylang ylang are available in 4 grades, and many oils, including lavender and rosemary can be sourced from many different countries. Bulgarian lavender is much more expensive than lavender grown in South Africa, and this price difference will be reflected in the final product pricing. Are the essential oils steam distilled or extracted with solvent? How about botanical extracts? The best botanicals are grown on family farms, without pesticides and herbicides, harvested the old fashioned way and hung to dry. These botanicals will cost the soap maker more per pound than the alternatives that are grown on factory farms, cultivated using chemicals and mechanically harvested and processed. This will be reflected in the price of the bar of soap. Lastly, look at packaging. You will find just as many different types of packaging as you will ingredients. There are bars wrapped in fabric and tied with twine; bars wrapped with a “cigar band” of cardstock, bars in boxes, shrink wrapped bars and those wrapped in fancy paper. All of these are good alternatives, the choice is a matter of personal taste, both on the part of the soap maker and the consumer. The intangible that goes into the cost of a bar of soap is the time and effort on the part of the soap maker. Is the bar of soap simple and unadorned, or are there multiple colours, embeds, swirls and mounded tops? Each step added to the process should add to the cost of the final bar, as it decreases the number of bars that can be made during a given period of time. Most handmade soap makers do not take their time into account when calculating their Cost of Goods Sold, which means they set their selling price too low. While this seems like a great deal for the customer, ultimately if the selling price is too low, the business will not survive. Some large retailers are now trying to cash in on the increasing popularity of the “all natural” movement by offering a line of handmade soap at a price which undercuts the small retailers. Don’t be sucked into this: look at the ingredients. Most likely you will find that they use one or two of the cheaper base oils, and you can be sure that they will have chosen the cheapest essential oil or fragrance oil they could find. Unfortunately, many people will buy this bar of soap, and will be left with the impression that handmade soap is nothing special. On the contrary, a well balanced soap, handmade in small batches using quality ingredients is a purchase that you will never regret. Try it….you’ll never go back to commercial soap! So better ingredients = more expensive bar of soap, right? Not always. Many artisans who create beautiful bars of soap using only the best ingredients price their soap too low in an effort to complete with the lowest priced product on the market, and some large brand name soaps are sold at exorbitant prices to cash in on the segment of the consumer market that believes anything expensive must be better. So do your homework, read the labels, and if you find a bar of soap made with quality ingredients at a bargain price, do yourself a favour and buy regularly, or in quantity, to ensure that your soap maker stays in business!